Noonan starred Cork beat Monaghan last weekend. MOST OF MY columns to date have been based on training. 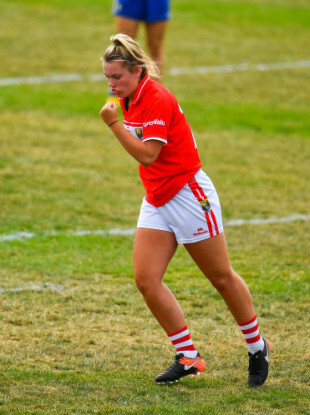 I’ve written quite a lot about balancing the training load with both Gaelic football and soccer, and pieced together some workouts to help you replicate my pitch training. Then I’ve written about more personal experiences through my career, sporting influences as well and highs and lows across the years. One thing I’ve only mentioned in passing is nutrition. Everyone knows how important it has become over the past few years, and how the right diet is key to success and could be the extra one per cent to get you over the line. 9am: Every morning’s the same. I’d always have a slice of brown bread with poached egg, and a turkey rasher and sausage. I’d follow that up then with a piece of fruit, normally either an apple or a banana. 12pm: My breakfast would keep me full through the morning so at midday I’d have a few pieces of fruit — an apple and a banana would do the job — to keep me going until lunch. 2pm: These times aren’t fixed but it’s just to give you a rough idea. An example of a lunch I’d make would be a pitta bread with chicken and lettuce. I get meals from Bodychef.ie (I’ll talk more about them below) so I’d take the chicken out of that and if it’s a heavy training day, I’d definitely go for more carbs. 5pm: Dinner time varies depending on what evenings I have training with the Cork footballers and Cork City but generally I’d have a similar meal every day — Meat, loads of vegetables and potatoes. A lot of the time my meat would just be chicken again with the veg everything and anything, usually carrots, broccoli and peas with spuds anyway. 9pm: Again, this depends on the day and how I’m feeling after training. I might have a Bodychef meal but then again I could just have a small snack before I go to bed. Most nights it’d be a cup of tea and two digestive biscuits — or a chocolate bar as a treat the odd time! Just on Bodychef, they’ve been such a great help to me personally. It’s so easy and convenient but not only that, the meals are nutritious and really nice. It’s handy because you can get the meals delivered to your house or collect them yourself on a Sunday night and you’re set for the next few days, and the same thing on a Wednesday. It saves so much time and takes the pressure off you. It’s all ready to go once you come in the door from training, pop it into the microwave for three minutes and the job’s a good one. They’re in containers too so there’s no need for washing plates and what not after. Of course, like many things, if I had the time I’d love to do more cooking and meal preparation but between training, matches, Gaelic, soccer, gym, recovery, work and other off the field commitments with family and friends, that’s not always possible. It seems like it’s always go go go, but I think unwinding is so important too. I’m not a big TV person so I’d rather listen to music to chill out and relax in my room. Hanging out with friends is another thing I love doing with my free time. Obviously when I was in school I could do it then and likewise at training, but it’s just not the same. At least one evening a week we’d all just hop in the car and go for a spin, go to the beach or do something nice to enjoy the summer weather. On another note, this weekend we face Armagh in our last round-robin game in the TG4 All-Ireland senior championship. We had a good win over Monaghan on Saturday so hopefully we can build on that and get better and better going forward. We had a loss with Cork City last weekend too so hopefully we can get back on track on that front too as the league heats up. Email “From nutrition and meal plans to training and unwinding - A day in the life of a rising dual star”. Feedback on “From nutrition and meal plans to training and unwinding - A day in the life of a rising dual star”.